The accompanying WealthScript C# code demonstrates how to generate the “Clear Method” Swing Line and plot. We elected to plot manually using DrawLine instead of using the PlotSeries statements in order to show the transitions like in the article’s plots. 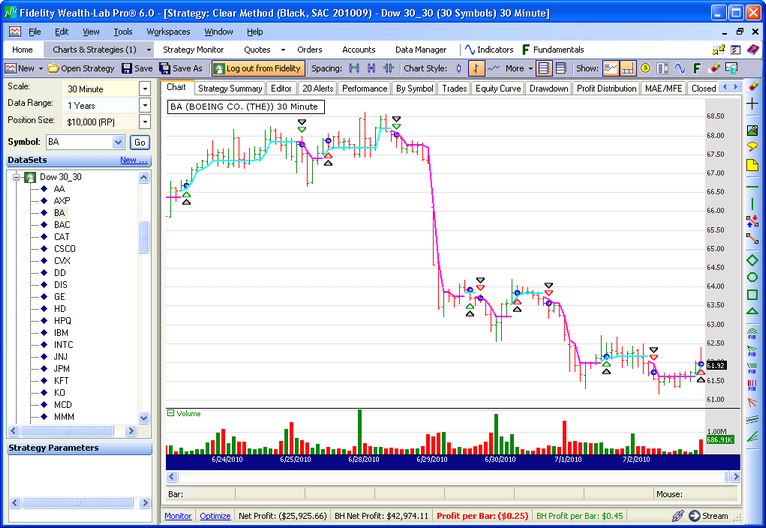 While the author wasn’t necessarily advocating the method as a stand-alone trading strategy, we added a stop and reverse strategy based on “Clear” as a matter of interest. In a 5-year raw profit backtest using daily bars, only 5 of the Dow 30 symbols returned a profit (excluding commissions). An idea for another test would be to take “Clear” trades in lower timeframes but only in the direction of the larger trend. Figure 1. “Clear” is certain to get you quickly into new trends, but you’ll have to live through the whipsaws along the way as with other trend-following strategies.